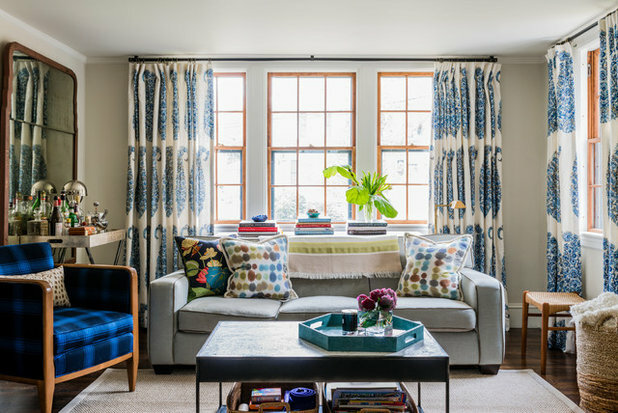 Interior designer Meghan Shadrick and her family loved their three-bedroom 1924 Dutch Colonial house in Arlington, Massachusetts, but it hadn’t been updated much over the decades. Plus, having just one bathroom for two adults and two kids ages 8 and 11 wasn’t ideal. 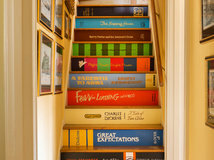 The idea was to make the home more functional and give it a family-friendly, chic and comfortable feeling. 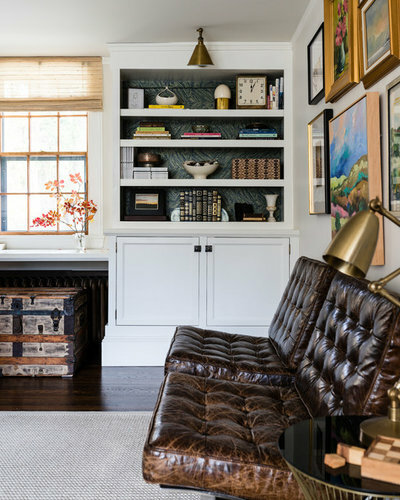 Shadrick wanted to respect the home’s age and style while freshening it up with a mix of old and new elements. 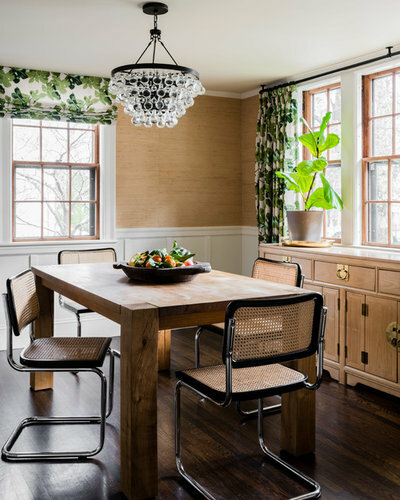 The renovation, which took place over several years, included cosmetic touches like fresh paint and wallpaper, window restoration, new millwork and built-ins, and layered textures and patterns with a focus on organic colors and materials. 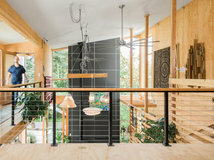 A later phase of the project was the recent two-story, 600-square-foot addition. Now there is a powder room and sunroom on the first floor and a master bathroom and walk-in closet upstairs. 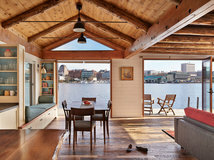 The house went from having one bathroom and 1,500 square feet to 2½ bathrooms and 2,100 square feet. “The addition changed our life,” Shadrick says. 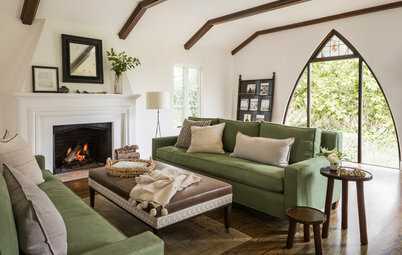 A variety of colors, organic textures and nature prints give the house the cozy feel Shadrick wanted. 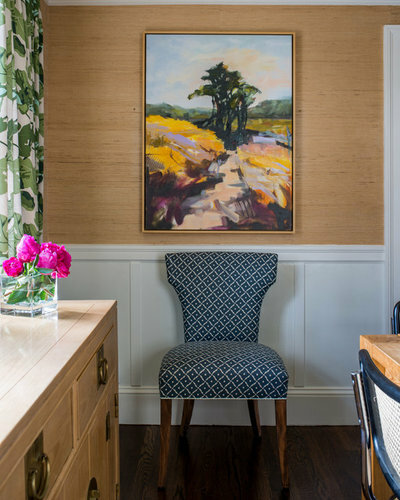 In the dining room, a grasscloth wallcovering contrasts with the white millwork and warms up the walls above new wainscoting that replaced an awkward chair rail. Fig leaf fabric by well-known Los Angeles designer Peter Dunham adorns the windows. “This brought a little bit of California to Massachusetts for me,” says Shadrick, who went on family vacations to the state as a child and has always “felt a pull” toward it. The textiles tie together an eclectic mix of furnishings, including a glass droplet chandelier, a chunky modern take on a farm table, cantilevered steel-and-cane dining chairs, an Asian-inspired buffet and an abstract landscape. 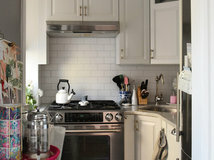 A previous homeowner had opened up the kitchen and the dining room to each other, but the spaces were still very dark. 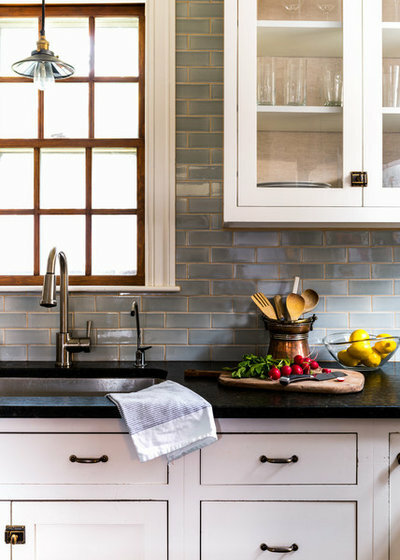 Shadrick went for a light makeover in here, painting the cabinets white, giving them vintage-style hardware and adding a backsplash of handmade blue-gray ceramic tile. This photo also gives us a good look at the windows. 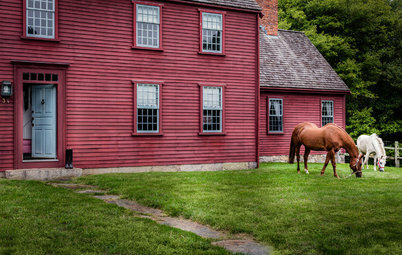 They were in bad shape, so the couple compared the cost of buying new windows versus restoring the original ones. The latter option gave them a great opportunity to maintain more of the home’s architectural history, and it wasn’t cost-prohibitive. When they look at the beautifully restored original wood on the muntins (the wood between the panes), they’re glad they made that choice. Shadrick chose light neutrals for the living room and designed new built-ins that combine cabinets, open shelves and a homework desk. The coffee table came with an antiqued glass top that wasn’t working for the young family, so the designer covered it in cork and gave it a metallic finish herself. “It wipes up like a dream,” she says. A shagreen tray adds a colorful touch of texture. 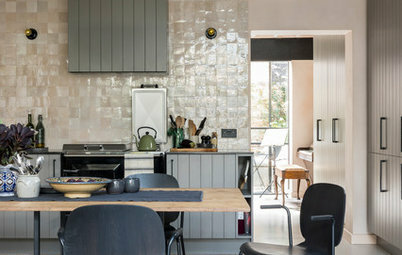 The home’s original cast-iron radiators are wonderful but presented layout challenges, and there were two in this room. Shadrick placed a console table, pictured, over one, and a homework desk over the other. She backed the open shelves in a wallpaper with a marbleized pattern that catches the eye and adds depth. The chest under the homework desk, pictured, was added just for the photo shoot. Tip: When choosing textiles, combine different scales, patterns and textures, Shadrick advises. 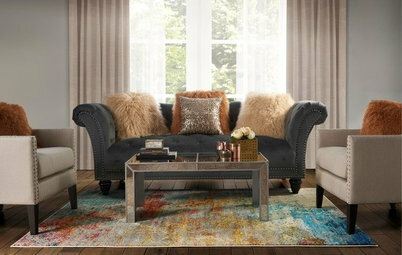 This room’s mix includes wool, linen, sisal, velvet and leather textiles as well as paisley, plaid and botanical prints. 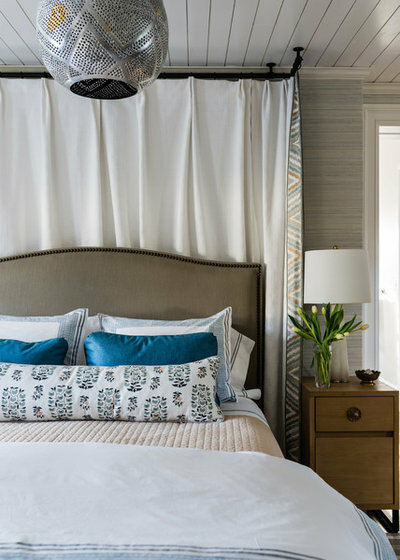 “By varying the textures, you can play with pattern because the look and feel is different,” she says. 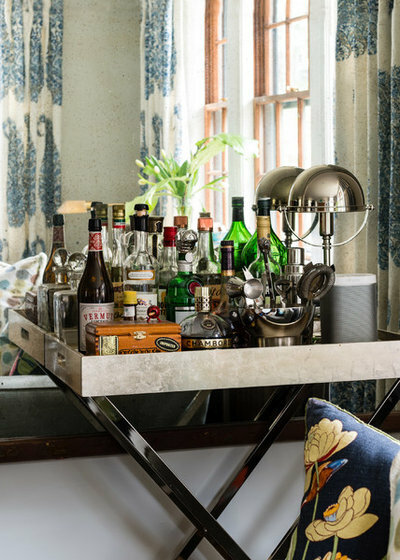 A mirror and a bar with a silver-leaf tray top add sparkle to what otherwise would’ve been a dead corner. 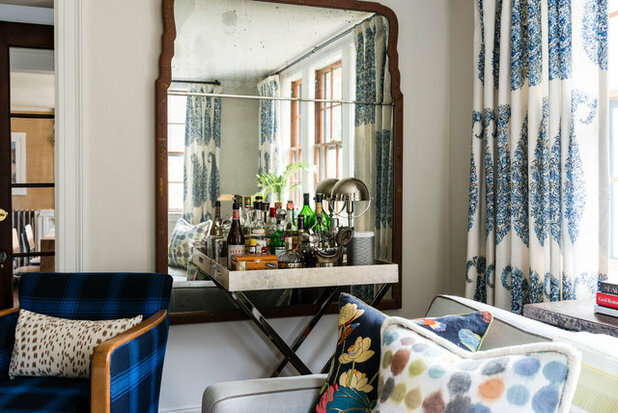 The mirror makes the room feel larger and reflects the pretty glass of the bottles. “The mirror adds so much dimension to the room,” Shadrick says. Tip: Add a small lamp to a bar like this for a soft highlight. This chrome lamp adds shine to the corner even when it’s off. The first floor of the new addition has a sunroom, breezeway and powder room. The sunroom serves as Shadrick’s office. 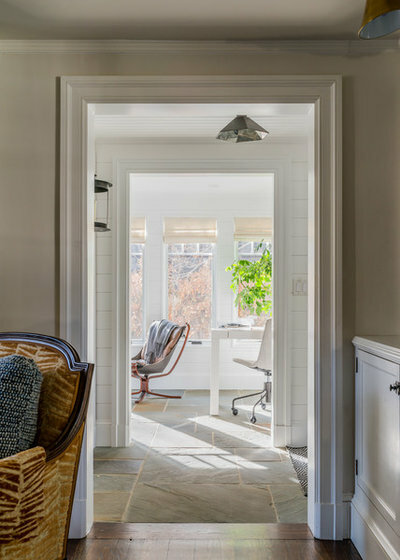 She chose a bluestone floor because it matches the patio outside, creating a connection between indoors and out. “We tore down a screened-in porch for the addition, and we felt bad about it. 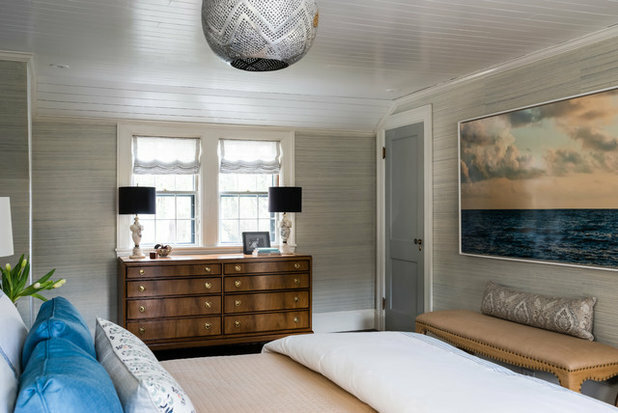 So we covered the walls in shiplap to give it a similar feeling,” she says. There’s also a built-in daybed in the light-filled room. “This is a great napping spot on the weekends, and it can also serve as an extra sleeping space for guests,” she says. Upstairs, the narrow master bedroom received a cosmetic makeover. The ceiling was cracked, which inspired Shadrick to cover it with shiplap for cottage-y coziness. She brought in more organic texture with a grasscloth wallcovering. A Moroccan-style perforated-metal pendant light adds an unexpected exotic touch and creates wonderful light patterns around the room. An awkward bump-out from the chimney made the layout difficult. Shadrick covered the bump-out with a decorative fabric treatment that created a backdrop for the headboard. 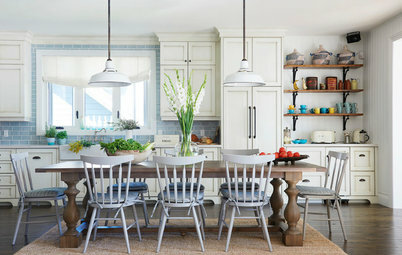 The color palette throughout the room is tranquil — warm grays, blues and creams. 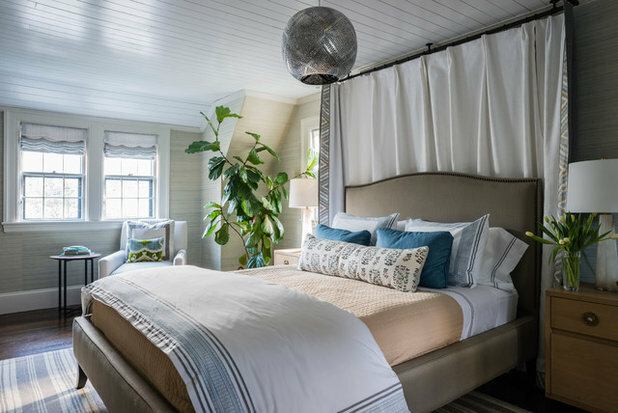 “Now our bedroom is more restful, cozy and warm,” she says. In the new master bathroom, the couple wanted to maintain the feeling of age that the rest of the house had. “We wanted it to feel clean and blend old and new,” Shadrick says. They did this by maintaining a Dutch Colonial roofline, which typically has dormers and slanted ceilings. She also converted an antique dresser she found after a six-month search on Craigslist into a vanity. “It feels like it could have always been there,” she says. 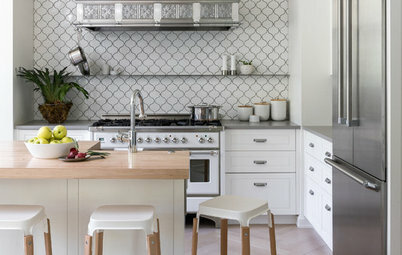 The floor is Lagos Azul limestone, which is brownish-gray, in a classic herringbone pattern. “This works for today or yesterday, and it feels grown-up,” she says. 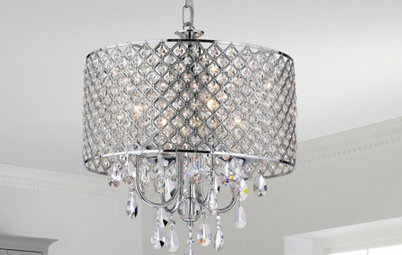 Overhead, a pineapple-inspired light fixture pulls another antique look into the room. 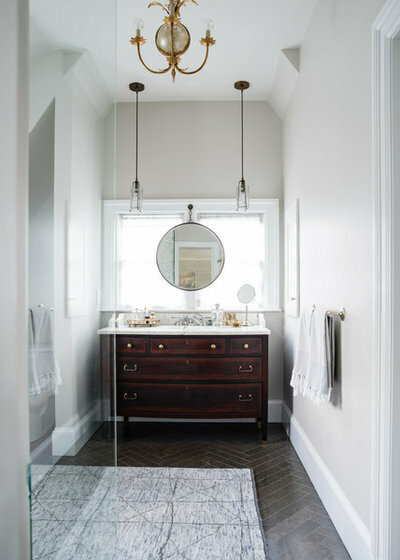 In the shower, the tile is a mix of 6-by-8-inch rectangular ceramic tiles, which have a more vintage look, and a Calacatta marble mosaic, which is an updated choice. (The bench is also Calacatta marble.) 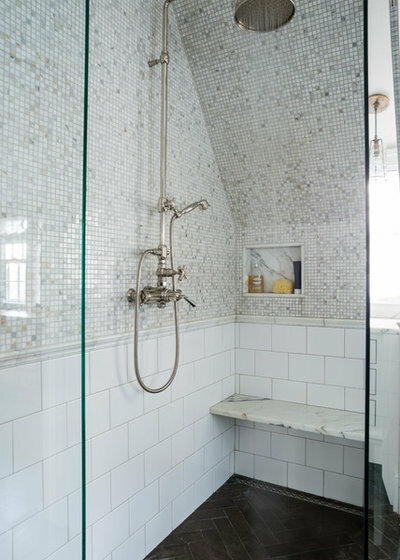 The new shower fixtures lean vintage, while the clear glass enclosure is more modern. This is the 8-year-old daughter’s bedroom. Shadrick gave it a cosmetic makeover with great style that her girl won’t soon outgrow. The Dutch Colonial roofline provided another challenge. Shadrick addressed the slant with another fabric treatment, this one in Schumacher and Co.’s Birds and Butterflies print. “This made the ceiling feel higher,” she says. It also cozied up her daughter’s bed. And on the ceiling, she performed a labor of love, stenciling the stars herself. A Lotus Capiz pendant light adds an extra flourish overhead. Tip: Eke extra storage out of nightstands by picking some with great drawers and cabinet space. 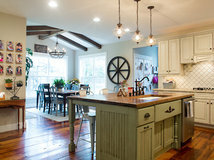 Freshen up an older home while respecting the original architecture by balancing old and new elements. Compare costs before deciding whether to replace or restore original elements like windows. 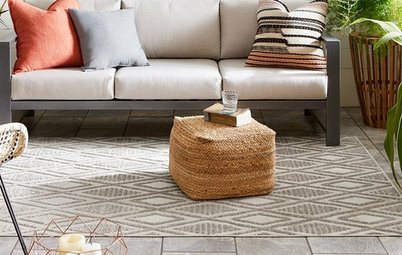 Layer a wide variety of textures and patterns to create a cozy atmosphere. Liven up a dead corner with a mirror or other shiny objects. 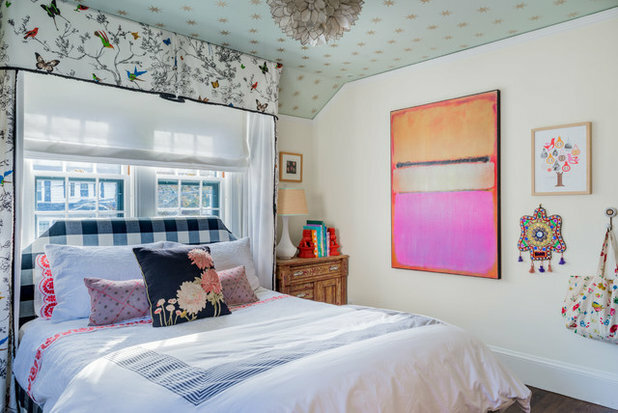 Use creative fabric treatments to address awkward ceiling angles and wall bump-outs. Hi Cheryl, I sent a message to Kay and let her know your problem and sent a link to your comment. I'm sure she'll appreciate it! I love it. And I really love the asian-style buffet in the dining room. Any chance I could get information on where they found it?